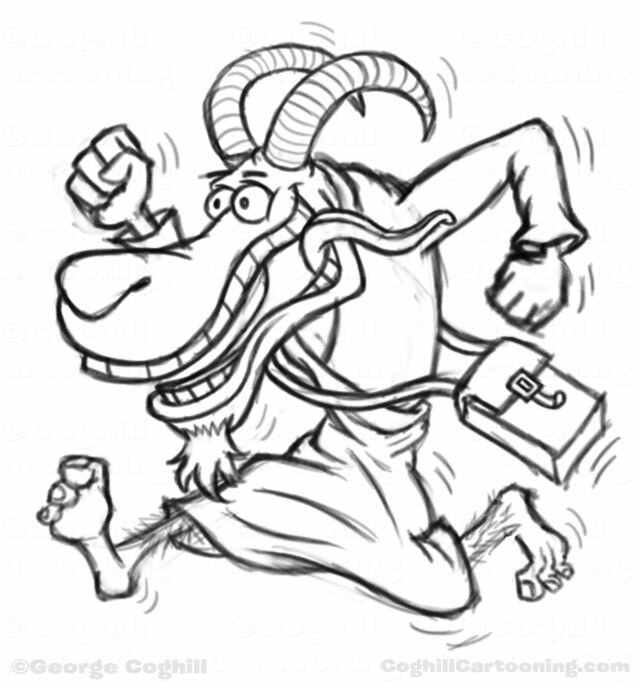 Cartoon logo featuring an Indiana Jones-style adventurer goat character for Mad Vagabond, craftsmen of handmade goat leather satchels, messenger bags and travel bags. They were looking for more of an Indiana Jones adventurer look. So with some tweaks to his facial expression and a costume change, we had the look they were after. With some variations to try out different poses and accessories, we arrived at the version seen in the color art above. It was especially fun to play with the Odd Rods/Ed “Big Daddy” Roth look for the face. It was also my first project involving a goat! I wasn’t too keen on the font, but the client chose this one and wanted a ragged, handwriting-esque look to it. I think this worked well for what they were looking for.